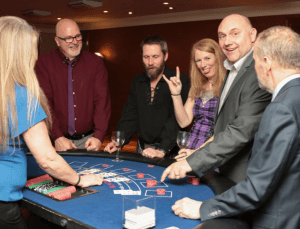 Trade Show finale – smooth mousse, a Bond-style casino & superb funky dance moves! Posted March 17th, 2019 by Guild & filed under News. ‘FUNKY’ is possibly not the first word that pops into a customer’s mind when he or she turns the door handle to find a cheerful Guild sweep giving a friendly salutation on the threshold of their home. 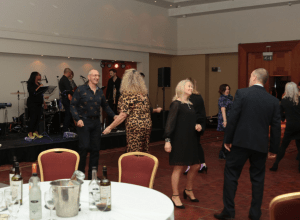 That’s why hotel staff raised more than one eyebrow at the sheer energy shown by our hip performers letting their brush down during the evening dance event, led by the fantastic seven-piece band Grooveology. Other sweeps, of a quieter disposition, were happier talking shop in the hotel bar area where there was a constant ripple of good-natured laughter or watching the wheel spin in the nearby Bond-style casino. Fellowship is, after all, at the very heart of the Guild. Don’t even ask what’s going on there! 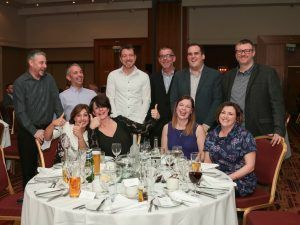 The evening began with the popular gala dinner with a record 145 guests. Dinner involved such gastronomic fare as smoothly smoked mackerel mousse and succulent breast of chicken wrapped in crispy smoked bacon (with buttered caraway kale, potato fondant, lentil & red wine sauce) – and pud treats including Red Berry Eton Mess, and blood orange and chocolate torte. 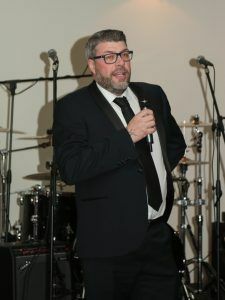 Rumbling tums appeased, helped somewhat by a glass or three, attention was turned to the superb charity raffle, which was held in aid of the CO-Gas charity, which works so hard nationally to raise awareness of the dangers of carbon monoxide poisoning. Grooveology then began the evening entertainment, which seemed to last until breakfast the next day! Speak up Gavin, we can’t hear you! 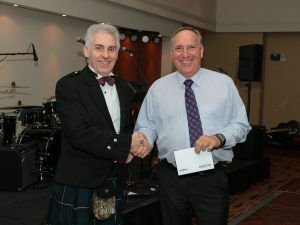 John Eardley receives a token of appreciation for his wonderful contribution to on-site training. 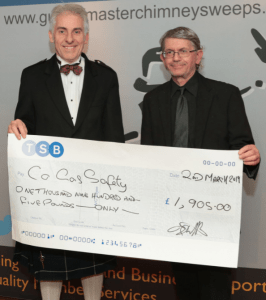 Paul Overton, a trustee for the CO-Gas Safety charity, received a new record amount of £1,905 presented by Lawson Wight, Guild chairman. Paul tragically lost one of his three daughters, Katie aged 11, in March 2003 due to CO poisoning from a faulty boiler and the rest of his family nearly died. 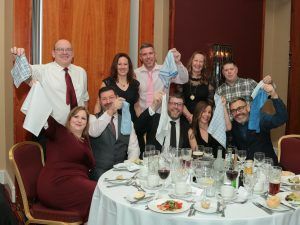 Stephanie Trotter, OBE, the President and Director of CO-Gas Safety, said that the charity was ‘incredibly grateful’ for the huge sum raised at the trade show by the Guild of Master Chimney Sweeps. She appreciated the public support by the Guild for the charity’s aims to raise awareness of the dangers of CO poisoning. Stephanie said: “The public need to be aware that carbon monoxide can kill quickly. “Working together with the Guild on actual cases has provided insight into the difficulties suffered by victims of CO and given rise to the CO Protocol, of which the Guild should be extremely proud. We will post a full article on the raffle with all the winners and those who donated later this week. A very big thanks to everyone who helped make this out best event to date.